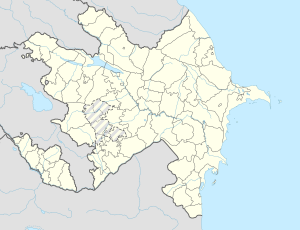 Yevlakh (an aw Avlakh, Jewlach, Evlakh) (Azerbaijani: Yevlax) is a sma ceety in Azerbaijan, 265 km wast o the caipital Baku. It is surroondit bi, but admeenistratively separate frae, the rayon o the same name. The ceety forms a destinct admeenistrative diveesion o Azerbaijan. In 1914 it haed "a bad reputation for fever in simmer." It wis the birthplace o Pavel Florensky. Yevlakh is ane o the important rayons o the kintra. The grain an cotton growin, as well as cattle breedin sectors hae played an important role in ceety economy. The fermers grow potato, vegetable, watter-melon an fruits, as well. Yevlakh Ceety is an aw rich wi naitural resoorces lik cley mixtur saund deposits, as well as cley, saund an graivel deposits needit for brick makkin. Baku-Gazakh heich-gate, Yevlakh-Balakan, Baku-Tbilisi railwey, Baku-Supsa gas an Baku-Tbilisi-Jeyhan ile pipeline extend throu the territory o the rayon. Yevlakh ceety an aw haes a domestic airport. ↑ E.M. Pospelov, Geograficheskie nazvaniya mira (Moscow, 1998), p. 149. ↑ Karl Baedeker, Russia: A Handbook for Travelers (Leipzig, 1914; unaltered repr. New York: Arno Press, 1971), p. 472.